If you are simultaneously using all three sockets in the vehicle, make sure that you do not exceed the maximum current draw of 45 A. Otherwise, you will overload the fuses. The sockets can be used for accessories with a maximum current draw of 180 W (15 A), e.g. lamps or chargers for mobile phones. ► Lift up the cover of the socket. 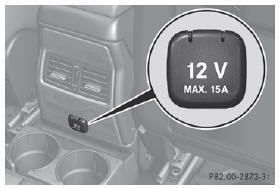 The cigarette lighter socket can be also used . This is the case even if the SmartKey has been removed from the ignition lock. 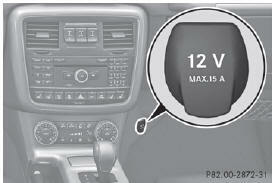 The socket is located on the center console in the rear compartment. 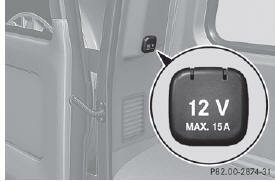 The socket is located in the cargo compartment on the left-hand side, when viewed in the direction of travel, next to the rear door.